L’Hermione,La Fayette, La Frégate de la liberté. 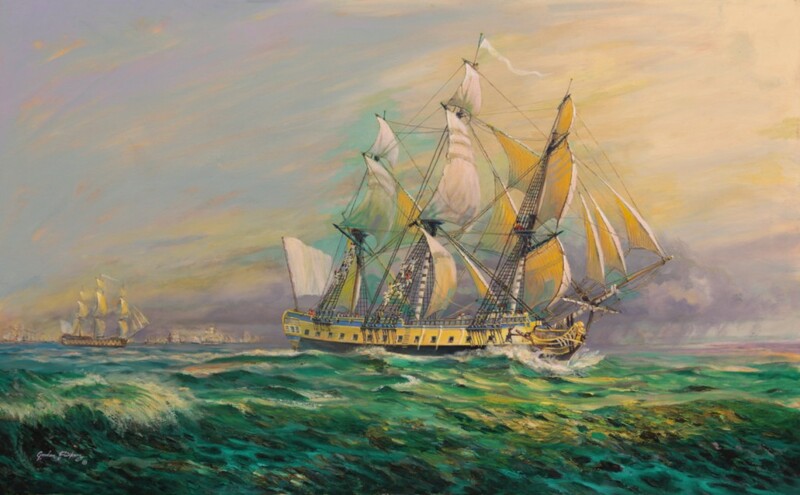 Hermione as shown here is sailing on the wide Atlantic which the French fleet of General Lafayette,, Hermione is seen escorting supplies, munitions and troops to support general washington with the American War of Independance. More recently, April 2015, a beautiful replica of this Concord class frigate, built at Rochefort sur mer, sailed in the wake of her predecessor to fulfill some of the reasons and emotion that inspired her creation, to visit the east coast of the United States of America as did the original Hermione when she carried the famous General Lafayette. 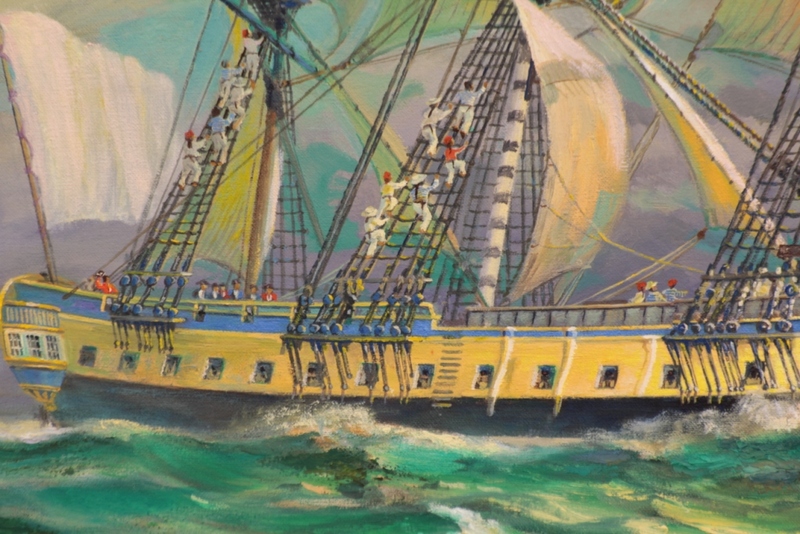 This painting resulted from an invitation to visit and tour of the ship while she was building, a fascinating experience, doubly so for Gordon Frickers who learnt traditional boat building skills at Falmouth Technical College then worked in the marine Industry for 10 happy years. The desire for liberty is deeply embedded in our souls and a constantly recurring them though history. Add to that a Frigate, to command a frigate like the dashing Hermione was the dream of every 18th & 19th century sea officer. 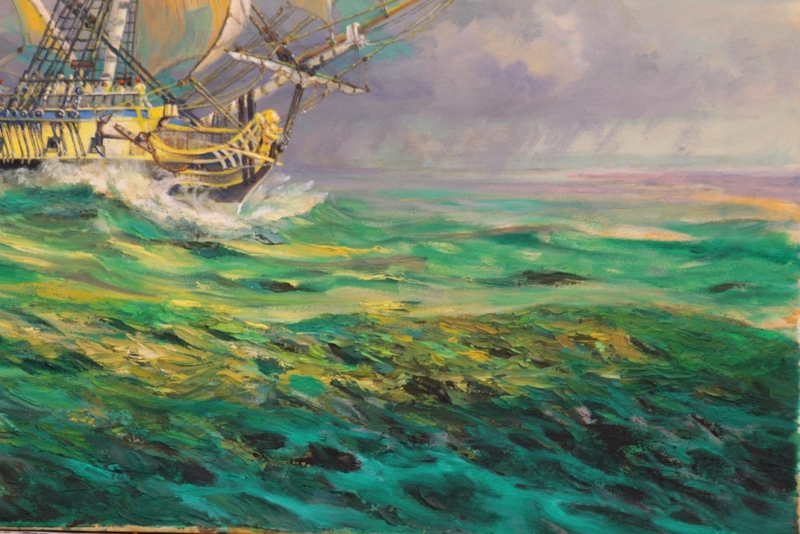 In this 762 x 1219 cms (30″ x 48″) painting of Hermione we see the frigate acting out one of her most important roles, eyes of the fleet. The ideas for this painting were generated on several levels. One was the awesome, inspirational project at Rochefort sur Mer. Many people talk of, even propose building an historic ship replica. The Hermione team have actually done it and done it very well. Despite all the prophets of doom and financial gloom Team Hermione have built a huge success and helped revitalise Rochefort sur Mer. Other reasons that inspired Gordon Frickers included the way Hermione‘s story is powerfully linked to the quest for liberty and spread of western civilisation. Historically Britain more than many countries has seen its self as a bastion of liberty and progress so there was a certain irony and much confusion for Britons faced by the colonial uprising in America. France and the USA have in effect embroidered ‘Liberty’ on their national flags. Today our liberties have never been more threatened in our combined histories. We can draw inspiration and courage from our illustrious predecessors. Every young 18 th century sea officer worth his rum aspired to command a frigate. Frigates were noted for their independence and dash; while not ships of the line of battle they could hold their own among the heaviest of cruisers. Gordon Frickers has here endeavoured to convey that excitement and the dash of an 18 th century frigate at sea. Hermione is shown changing course and probably about to change sails. The image is primarily based on material gathered during a visit to the ship yard at Rochefort sur Mer while Hermione was building. On that occasion he was generously given a guided tour by the press officer Isabelle Georget and introduced to many of the team. Lacking a suitable rigging plan for Hermione Gordon Frickers followed the plan of a similar well know French frigate of that period, “La Belle Poule”. Fortunately Gordon Frickers having sailed on a vessel with a similar rig (Maria Asumpta built 1859) so has little difficulty interpreting the frigate’s rigging. Carefully composed lighting, colour, contrast arrangements and in the fore ground the rhythm and texture of the paint all contribute to convey drama to the ship and great depth in the painting. The painting is designed to provoke your imagination yet is still rich in detail for you to explore and enjoy. This painting measures 762 x 1219 cms (30″ x 48″), oils on canvas,Price of the original £6,000.00 ex studio ex frame. Payments by agreement can be made in easy stages via our ‘payments’ page or bank to bank. Hermione truly was a ship that changed history: “So that freedom lives, men will always have to stand up and fight against indifference and resignation.” La Fayette who’s name is linked to Hermione was such a man. He remains a symbol to this day. ~ “Pour que vive la liberté, il faudra toujours que des hommes se lèvent et secouent l’indifférence ou la résignation”. Rochefort a town of much charm on the Atlantic seaboard of France as a town in serious decline. The Municipal saw an opportunity toreinvent Rochfort with this replica ship project creating a brighter future based on a heritage which is unique in the world. The Corderie Royale, a marvellous Arsenal was built 1666-1669 to supply cordage for the French ships of war. 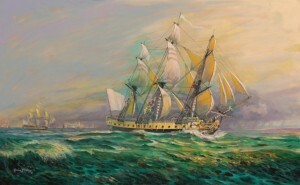 In 1779, Louis XVI commissioned the building of four identical frigates in Rochefort that included La Fayette’s Hermione. Rochefort was finally abandoned as to small for 20 th century requirements of the French navy. Fuel to the fire, the Corderie Royale was destroyed in 1944 by retreating Germans. Happily today the complex is restored after 20 years of effort, includes several dry docks, the oldest dating from the 17th century and open to visitors. Hermione(1779) was a 12-pounder frigate of the Concorde class built for the French navy. The new Hermione is a full size replica. Archived plans for this class of warship were presented by the British, shared with the Association Hermione-La Fayette in order to rebuild the Hermione at the arsenal in Rochefort according to original specifications. The ship has been constructed in an open-air interactive museum, where artisans revived original craftsmanship and utilized original materials. The museum has attracted millions of visitors to the reconstruction project. The Hermione-Lafayette Association since its foundation 19 years ago has attracted artisan craftsmen from France, Britain, Germany, Spain and Sweden and now comprises some 8,000 members. The Hermione project at the Corderie Royale arsenel cost 25 million Euros (US $32 million). Hermione was financed by more than four million visitors to the shipyard which is also home to Rochefort’s original arsenal as well as through crowd-funding initiatives for specific parts of the ship. More than two million visitors have over the last ten years, visited Hermione in her dry dock, situated just a short walk from the old Corderie Royale of Rochefort sur Mer near La Rochelle. Over 50,000 people attended the Launch of Hermione at Rochefort while a live satellite simultaneously broadcasts the launch event over much of Europe andto the Salons of the French Consulate in New York City. The Rebuilding of Hermionethe frigate Lafayette is also a way of paying an authentic French homage to liberty in the tradition of the gift of the renowned Statute of liberty, saluting La Fayette and his comrades French and American who kept alive our threatened liberties as we must continue to do inspired by the memory of this great adventure for liberty, courage and solidarity between people. Hermione will in 2015make her landfall at Yorktown, Virginia and call at ports including Yorktown, Mount Vernon and Philadelphia to New York and Boston. Hermione will parralel by sea the route from Rochefort to Boston made by a young man who sought adventure and became among many other achievements, practically a son to George Washington and the French General Gilbert du Motier Marquis de Lafayette. Her progress can be followed online, details at the end of this post. Hermione’s itinerary will reaffirm the long and historic relationship between the United States and France and the cause of liberty. As L’Hermione moves up the Eastern seaboard, she will be accompanied by a travelling exhibition. It will be part of an expansive outreach program, digitally enabled, which will reach out to millions of people. To honor a friendship that has lasted more than 200 years between two of the most influential nations in the world, the United States and France, the Association Hermione -La Fayette embarked on a journey to re-create a piece of history with a modern twist by reconstructing the Marquis de La Fayette’s frigate Hermione. Are you going to miss your chance to acquire this very original painting or commission a similar painting or print; simply, securely; to place a deposit or payment on our Payment page to make this your Gordon Frickers original painting (or acquire subject to availability, a beautiful Heritage quality print)? King Louis XVI commissioned the Hermione to signify France’s support for the American revolutionary efforts. La Fayette’s historic voyage to aid George Washington‘s cause in America’s War for Independence started on March 21, 1780, when Lafayette set sail from Rochefort, France to rally, supply and bolster rebels revolutionaries, fighting British troops in the war of independence that lead directly to the birth of The United States of America. Many scholars agree that struggle in turn lead to the French revolution. It took Lafayette 38 days to cross the Atlantic on a voyage looking for a reputation as a renowned military mastermind and a hero of the American Revolution. La Fayette and his troops would help stave off the British at the naval Battle of Chesapeake Bay and at the land Battle of Green Spring, which would ultimately lead to General Cornwallis’ surrender in Yorktown on October 19th, 1781. Hermione became famous when she carried General Lafayette to the United States in 1780 to allow him to rejoin the American side in the American Revolutionary War arrived in Boston on 28 April carrying the then-secret news that Lafayette had secured French reinforcements (5,500 men and 5 frigates) for Washington. She was underway again on 2 June and suffered serious damage in the fierce but indecisive Action of 7 June 1780 against the 32 gun HMS Iris, under James Hawker. Hermione received the American Congress on board in May 1781. Hermione fought several times in company with the Astrée, commanded by Lapérouse who’s later voyages of discovery is the subject of another of Gordon Frickers paintings, “Laperouse at Botany Bay”. From Facebook: by way of supporting the Hermione project I translating French into English, a post about the frigate Hermione currently visiting the USA and La bataille navale de Louisbourg , see below the next in=mage for the text, enjoy. ‘They’ kindly wrote ” L’Hermione frégate de la honte merci pour la traduction Gordon Frickers”. Hermione was wrecked in 1793. 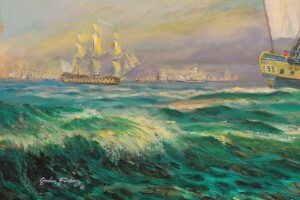 The naval battle of Louisbourg was a naval battle that took place during the War of Independence of the United States between two frigates of the French Royal Marine and a British convoy of 18 merchant ships escorted by several ships of the Royal Navy off Spanish Harbour River on Cape Breton, Nova Scotia (present city of Sydney). Despite their numerical inferiority, the two French frigates L’Astree (38) and Hermione (34), commanded respectively by captains, Laperouse and Latouche Treville, attacked and put to flight the enemy convoy. Falmouth Marine School, Fal Tech as it was affectionately known was since then renamed Falmouth Marine School. In Gordon’s ‘day’ the courses were excellent, the tutors had all been working ship wrights and boat builders who had completed full traditional apprenticeships at highly respected yards like Porthleven. Today’s Falmouth Marine School provides a comprehensive selection of courses from introduction to degrees in partnership with Plymouth University. They specialise in Boatbuilding, Leisure & Watersports, Marine Engineering and Marine Science & Biology. FMS has a deservedly excellent international reputation for our marine courses with superb facilities including boatbuilding and engineering workshops, a dedicated marine science lab and a well equipped watersports centre. The tutors still combine industry experience with academic expertise and are active in their field through research and personal interest in their subjects. Kindly share and mention this Gordon Frickers painting, article and website when contacting Association Hermione-La Fayette, every share helps the arts, thank you.